Marble is an iconic addition to any home that is always classy and elegant. If you’ve decided now is the time to start living the fairy tale marble promises, consider using the following marble tile floor pattern ideas as you start searching for the perfect marble for your home. Minimalist designs rely on the bold veins within the marble to create the pattern. This works best when you use a glossy finished marble that has thin grout lines. When finished, it creates a sleek finish that is smooth and even. 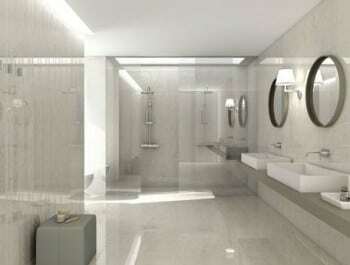 You can also opt for a traditional design by using Carrara marble. By choosing either rectangular or square cut tiles, you can use two different shades of the tile to create an understated checkerboard. You can also use Carrara marble to create more detailed patterns such as pinwheels. Finally, if you want a more laid-back appearance, use rough cut tile of multiple sizes to create a random pattern. This will create a more casual flow within the room. We invite you to contact Conestoga Tile for more about these marble tile floor pattern ideas, and the tiles we carry that can bring them to live within your home.